PURE N54 Stage 2 Turbo Upgrade! This turbo upgrade is intended for those looking to hit big power goals while maintaining the stealth OE look under the hood. These turbos can work with both stock 1.81" and larger 2" inlet kits. 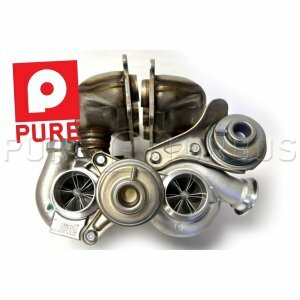 Feel free to use these turbos with any inlet kit your prefer. We are offering a no charge machined inlets option. We can build these turbos with stock inlets or modified machined inlets, customer's choice. The stock style inlets have no bead roll, and are too short. Silicone hoses want to squeeze off the stock inlets. We created a solution for this by using our machined inlets which feature static friction channels and bead rolls. The inlets simply do not come off with this upgrade. All our Stage 2 Upgrades come fully optioned with thrust upgrades, billet wheels, etc. There's no extra charge for features we consider standard issue.